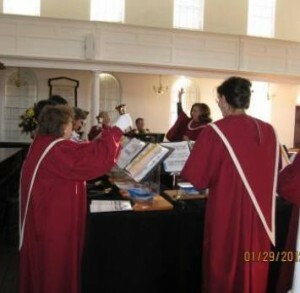 Music is an integral part of worship, discipleship, and our mission at Johns Island Presbyterian Church, offering many ways to get involved. Whether you are a seasoned musician, a beginner, or just love music, you will find that music at JIPC is enjoyable and enriching, while providing an opportunity to grow musically, socially, and spiritually. Whether we are singing ancient, classical, modern, or gospel music, the goal of our choirs is to enhance the worship experience of every member and guest at JIPC. In striving for this goal, most of us find ourselves enriched and invigorated each week. There are two opportunities to participate: those who sing at the 8:30 service rehearse at 3:30 PM Wednesday afternoons and those who sing at the 11:00 worship service rehearse Wednesday evenings at 7:00 PM. You do not need to be a seasoned singer or read music to be a part of the choir. We are all from different musical backgrounds, learning and growing together as a group. Outside of our worship and rehearsal experience, we enjoy gathering for food, fun, and fellowship. Church. The ability to read music is a plus, and the only thing we ask in return is that you can count rhythm, commit to rehearsal on Thursday evenings, and perform during worship services once a month. You are invited to become a part of this fun-filled group. The Children’s Choir meets Sunday afternoons during the Kids for Christ program and is open to children four years of age and older. Children do not have to be able to read music or have prior experience to participate. The focus is on improving aural skills, learning to read music, and singing, in parts, using proper vocal technique. 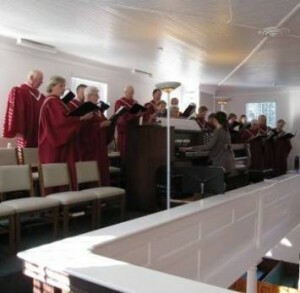 The choir performs monthly during the Sunday morning worship services. This is a wonderful opportunity for children to be an integral part of the worship experience and all children are welcome and encouraged to join us. Do you play a musical instrument or have other musical talents? Our music program is not limited to singers and ringers. If you play an instrument and would like to be a part of the music programs, we welcome you! If you are interested in participating in any of these musical groups, contact Sarah Smith, JIPC Director of Music.